The Mazda Miata and Fiat Spider are built from many of the same components on the same production line by the same workers. However, there are key differences and the engine and transmissions are the biggest two things that set these vehicles apart from one another. Although the Fiat 124 Spider Abarth has more peak power, 164 hp vs. the Miata's 155 hp, it is almost a second slower in the sprint from 0-60 MPH. Many enthusiasts prefer a normally aspirated roadster, but more power is always welcome, as long as comes with an advantage. One advantage some turbo fans have pointed to is "power at elevation." The idea is that an engine with a built-in compressor will retain more of its usable power in the mountains, or anywhere above sea level. The theory goes that since the air is thinner, and since the turbocharger compresses the air, the turbo will do better. A new test by The Fast Lane Car (TFL Car) has just debunked that myth. The publication tested two Miata trims vs. the 124 Spider Abarth. What makes the test interesting is that it was done at just under a one-mile elevation in Dacono Colorado. Would the Spider Abarth's turbocharger give it the extra advantage at this elevation? Not according to the runs the publication made. 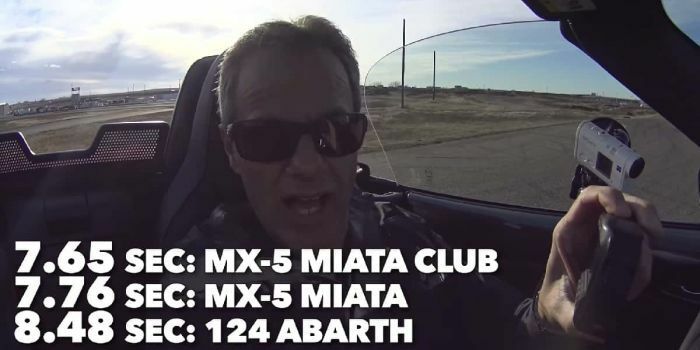 The Abarth was beaten by both the Miata Club and also the Miata Grand Touring. As the top of page image shows, the approximately one-second advantage the Miata has proven to have in prior tests closer to sea level holds at over 5,000 feet. The group also timed the cars around the racetrack.Would the turbo have an advantage in that scenario? You will have to watch the video to find out. We aren't going to spoil this good story by TFL Cars. If you think you know why the higher-power Spider Abarth can't seem to beat the Miata in a sprint, let us know in the comments below. To properly disprove the greater impact of NA engines compared to forced induction engines at high altitude, they would have needed to test the cars at sea level and then at altitude. This test only proves that any difference in the impact of the thinner air isnt significant enough to make up for the general performance advantages of the Mazda. Really, performance numbers for all three cars comparing their times at sea level and at high altitude would have been far more useful than comparing three cars at high altitude. I think the noticible turbo-lag of the Fiat 1.6 is accountable for perhaps half a second (maybe more) difference 0-60 at sea-level, as boost is pulled/waste-gated on every manual-trans shift. This lag can only be exacerbated at altitude by the thinner air and lower ambient atmosperic pressure, as the turbo needs to reach a higher speed to produce as much boost (absolute air charge-density/pressure) as at sea level. A good tuner might be able to patch this up in the engine controller software without the need to switch to a turbo with a lower A/R ratio.